I have been thinking about this post for the past month. I miss what used to be a big part of my life: sewing and then sharing. So it’s time to break the silence. As soon as I scraped myself off the ceiling about the sudden death in my family, Patch entered what looked to be time for more surgery to remove his latest crop of tummy tumors. But there are too many tumors to do surgery. So we did chemo to shrink them. And found the cancer had spread to his lungs and possibly his brain. He’s had some strokes or brain malfunctions and ends up with problems like missing the door by a foot and a half or loses some abilities like walking or hearing or seeing. Right now he’s not able to keep anything down. But still Patch has good days and bad days. So he’s resting except for bathroom and sick breaks if I’m lucky enough to catch him in time. Everything changes all the time and I’m on a dog watch and cleaning, cleaning, cleaning. In between I have been slowly working on a bodice and skirt sloper following the techniques given in the book The European Cut by Elizabeth Allemong. I have made mistake after mistake: taking my measurements wrong (especially in getting a waistline that isn’t level), putting on weight and taking it off, misreading the directions, inaccurate drafting measurements, and for the life of me cannot get 2 photos of the same muslin that reveal the same “problems”!!! This is ridiculous. I’m made slopers that fit before and drafted (and draped) my own patterns. My focus is elsewhere. 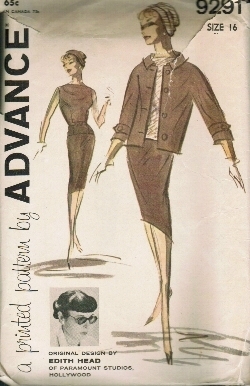 All I wanted was a solid sloper on which to base alterations to the Edith Head pattern, Advance 9291. I’m in a sloper slump, something I’m sure others have suffered through and survived, and I will pull out of this as soon as the weather warms with Spring. I am absolutely am not going to cut short this dog’s life to get the freedom I think I want. He’s as much a part of the Whole of Life as I am and he cannot be slighted any chance to live it. My needs can wait for the time being. I know he appreciates having a real home in the meantime. Dying alone will not be in his future. And I hope to be back to producing sewn garments soon with Patch sleeping by the clear glass door in the sewing room and next to his buddy, Gaely GoLightly. Posted in Cancer, Couture Sewing Techniques, Dogs. Bookmark the permalink. I am so sorry for all you’re going through. Oh Mary Beth I am so sorry to hear about all that you and Patch are going through. I so hope he gets better soon. You are such a good person to be taking good care of him… your Whole of Life attitude is wonderful. When you get your focus back your sloper will work out. Hugs MB!! 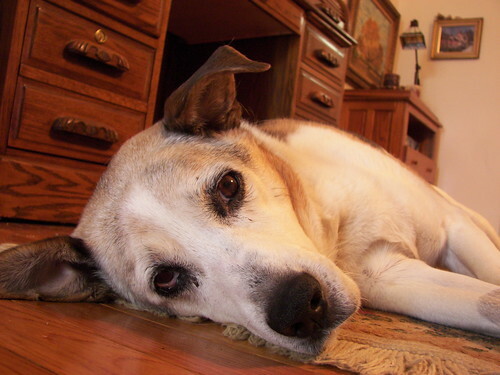 Our oldest pooch Pepper, who will be 15 next month, is declining too and I don’t want to even think about the future. Last week she couldn’t use her rear legs at all but this week she’s walking (waddling) around again. At no time does she seem to be in pain so that makes it easier on *us*. I’m willing to carry her outside and prop up her rear end so she can do her business if that’s what I need to do and she seems to welcome the extra help. Here’s hoping your Patch and our Pepper enjoy their last days pain-free and fully loved, and go peacefully when it’s finally their natural time. So very very sorry to read about Patch! This must be hard on everyone after rescuing Patch from such a tough life. As long as your doggie is painfree then go for the long haul, I would say. A great big family hug for you all. My condolences on your recent bereavement. So sorry to hear about your puppy. You are a good caregiver. I have missed your posts. Sorry to hear about Patch. Poor sweet Patch. He is so lucky to have you there for him. I’ll keep you both in my thoughts. I am sorry you are having to go through so many traumas. Please know my blessings are with you. Oh MB, I am sorry! You are really having a rough time lately. I hope Patch is not suffering much. I completely understand about giving Patch the chance to live out the rest of his life. I mean, would we put Grandpa down because he had tumors? I don’t think so and I’m sure you love Patch and he loves you as well. Sewing and muslins can be difficult in the best of times so I’m glad you’re not being hard on yourself. Like you said, your thoughts are elsewhere. You are doing the right thing for you and for Patch. Take it easy on yourself for as long as you need, you will never regret it. Patch knows you love him and that you are doing your best for him, MB. Sewing will be there. Patch just needs you more right now. Hugs from someone who has been through it. Sorry to read about Patch. He’s had a wonderful life since he’s been with you. He will let you know if it’s time to let him go, that doesn’t make it any easier. As far as the sewing, I’m glad you realize you have a lot on your mind, therefore the slow-down. We all have those times, unfortunately. Hugs to you and Patch. I hope that Patch is feeling better soon! Sending strength and compassion to you during this time. Patch is truly fortunate to have such a wonderful Mom. I’ve gone through the senior dog as well, and know exactly what you’re going through. Be kind to yourself, and don’t force the sloper. It will come in time, with Patch and Gaely infusing the sewing room with canine contentment. Hugs to you both! Life is too short to be spent on petty things. You’re pouring your heart out for this sweet dog, and even though he can’t always show it, I know he knows you care. I had to care for my elderly cat two years ago at the same point in his life and still remember all the work, but yet the look of love and trust in his eyes as I took care of him. I’m so sorry about your dear friend Patch. I’m not entirely sure I’d be able to think of anything else if one of my cats started getting ill, especially not my sewing, so it’s really not suprising that your focus isn’t there. Be kind to yourself, right now sewing doesn’t need you. Oh Poor Patch! And hugs to you. I would be barely able to think about projects if one of my furry babies was ill. Don’t worry about producing things, just loving your family. Hi Mary Beth! Give Patch an extra chest scratch from me.